The Priestess – or High Priestess – third of the Major Arcana, corresponds to the Hebrew letter of Gimmel. The letter Gimmel symbolizes a man running; more specifically, a wealthy man running to catch a poor man to reward him. The letter signifies also a journey, as emphasized in its original pictographic meaning as “camel.” More specifically, this journey is that made between the divine and mortal realms, relatively frequently. It is not exactly like the Fool’s journey of self-discovery, for the Priestess does not seek to unify the world, but just travel between them. Indeed, she herself stands behind a veil, the division between the two worlds, and keeps the mysteries of the divine realm from the mortal worlds. She acts as a sort of judge, giving out punishment and reward in order to restore the balance of the soul (as also hinted at by the meaning of Gimmel). She is the bridge between the two realms, who imparts divine wisdom upon those who ask. She represents also generosity and the passing of secret, esoteric knowledge to others. She is the counterpart of the Magus; they both are teachers, but in different ways. The Magus actively steps out into the world and trumpets his message, but the Priestess sits impassively in her table, letting her students come to her. She is more mystical and mysterious. Her astrological element is the Moon, and she herself embodies the aspect of the Moon referring to the Eternal Virgin of Artemis. She is a blank slate on which the sun’s light is reflected; she makes it possible for others to realize their full potential. She is a calm source of security, and is completely in control of her emotions. She is the feminine to the Magus’ masculine, and represents also the steadiness of the lunar cycle. She is the blank slate that the Magus uses to realize his own potential, and may have even taught him herself. The Priestess stands behind a veil in the Thoth art, which has in front of it offerings of fruit and gems from students seeking to learn her secret knowledge. A camel – homage to her association with Gimmel and the journey through life that she helps guide people through – is also present there. She herself stands calm and partially hidden and clouded by the veil. Her virginity is seen in the bow of Artemis lying across her legs, and she holds her hands forth in either an embrace or supplication. The Rider-Waite shows a similar image, with a calm, serene Priestess seated upon a chair, the paper in her hand partially obscured, and the moon at her feet. Behind her are the fruits seen in the Thoth art, which also can represent her nurturing aspect; she teaches by looking after the safety and security of her flock. The Priestess represents the hidden mysteries in life, and the passive teaching style. She focuses on the inner self, in opposition to the Magus’ focus on the exterior. The Magus represents the conscious will and manipulation of the world, while the Priestess represents the unconscious influence and one’s unintended influence on the world. She helps one realize their full potential and provides them with a secure realm in which to do it. 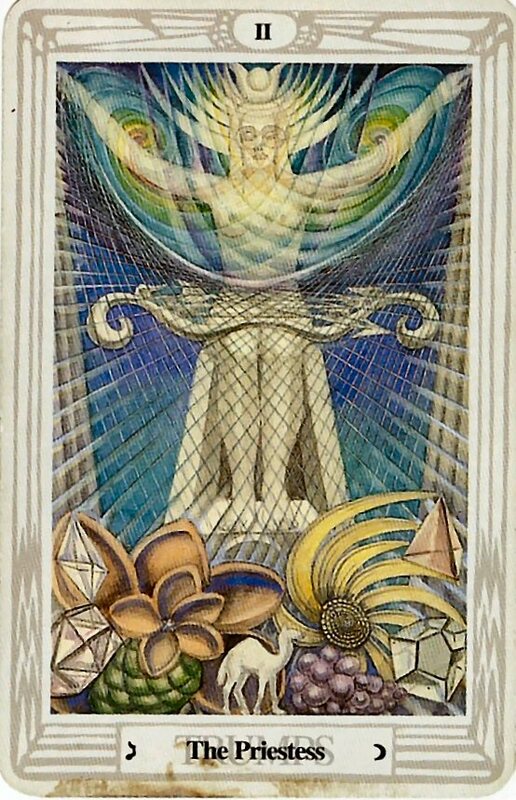 She directly channels the light of the Sefirot of Kether (Spiritual Perfection and Emanation) into the Sefirot of Tiphareth (Balance and Conscious Harmony) in her role as the path between those two Sefirot in the Tree of Life. Her divine knowledge from Kether, passively passed on to those in the more material world, helps others achieve the balance and harmony of Tiphareth consciously; she is the silent guide, always obscured behind the veil. She represents also the mysteries of life, and secrets. She possesses hidden knowledge, and may share it with you. She is also the symbol of femininity, and the mysteriousness, passivity, and inward focus commonly associated with it. In a reading, this card asks you to examine the role of secrets, mysteries, and forbidden knowledge in your life. Do you know something that maybe you shouldn’t? It also asks you to think about how a calm sense of security might affect your life, or perhaps how a helping guide might help you get your life back on track. Reversed, this card’s energies are blocked, hidden, or twisted somehow; is your guide leading you astray? Is your serene security perhaps not so secure – or serene? Will your forbidden knowledge lead to your ruin? This entry was posted on June 12, 2011 by Z. M. Wilmot. It was filed under Tarot .